Steiff donkey pull-toy with wooden wheels on metal axles attached to the feet. Covered in gray wool felt with a brown leather saddle and a red felt blanket. Black yarn mane and black horsehair tip on tail. Manufactured by the Steiff Company of Germany. 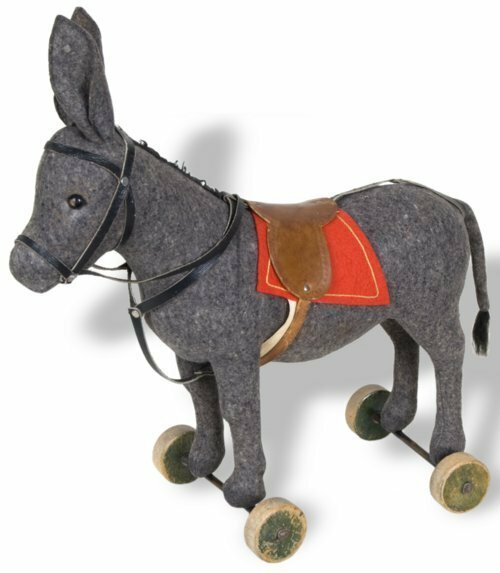 Herbert Huff received this donkey pull-toy as a gift in the early to mid-1920s. An invalid from birth, he died in childhood.